We heard you. In last month’s VaNews survey, some readers valued VaNews’ no-frills design. Others asked for a modern makeover. We decided to go for both. 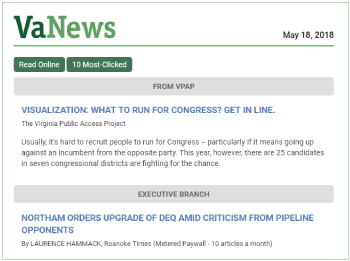 With subtle formatting changes and a hint of color, VaNews is easier to read. VPAP's data visualizations and other content are now in a more prominent position. Another common request was from readers who want to follow the news, but don't have time to scroll through several articles each day. A new button at the top of the email will take you to the 10 Most Clicked articles, deemed the day's most important by VaNews readers. Your feedback is always welcome. Thanks for reading VaNews.